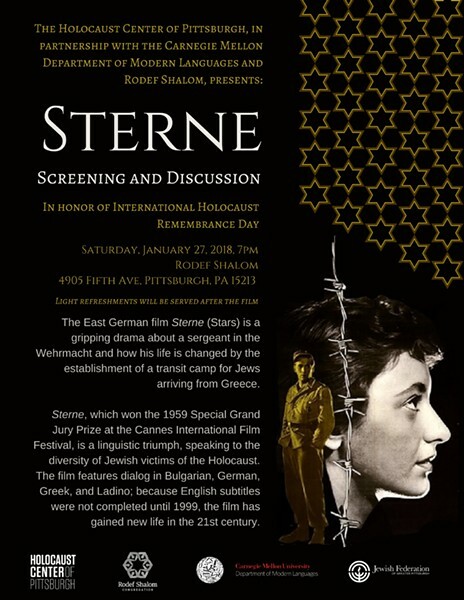 The Holocaust Center, in partnership with the Carnegie Mellon Department of Modern Languages and Rodef Shalom, is marking International Holocaust Remembrance Day with a special screening of Sterne (Stars). The award-winning East German film is a gripping drama about a sergeant in the Wehrmacht and how his life is changed by the establishment of a transit camp for Jews arriving from Greece. This will be the first time Sterne has been shown in Pittsburgh. Price: $10; free for students (with valid student ID) and survivors.